Sparkling City Chorus has a wonderful history. Some of our performers have even made membership a family tradition, by recruiting their daughters! We've come a long way and our journey has many interesting highlights. Chartered in 1971, the Sparkling City Chorus is one of many dynamic chapters in the world's largest women's association of acappella singers, Sweet Adelines International. Under the direction of Kathy Littlefield, Interim Director, the chorus members spread their love of barbershop harmony thoughout the Corpus Christi community. The mission of the chorus is to promote and preserve this unique style of music wherever and whenever possible via public and private performances and by supporting local school music programs. Our members are skilled vocal performers. They range in age from early twenties to senior citizens; all shapes and sizes, backgrounds, careers; from Corpus Christi and nearby Coastal Bend cities. Sparkling City Chorus rehearses at the Parkway Presbyterian Church, 3707, Santa Fe each Tuesday at 7:00 pm. 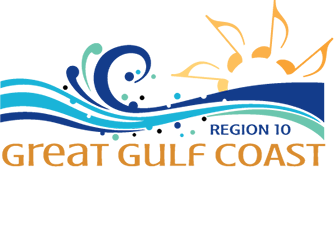 Sparkling City Chorus is a non-profit 501(c)(3) cultural and educational chapter of Sweet Adelines International supported by members' tuition fees, Valentine Sing-A-Grams, fundraisers, Corporate grants and friends in the business community. 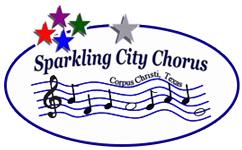 If you would like to sponsor Sparkling City Chorus please call 361-992-0325.